Summary: Its no masterpiece but it gets at least three and half chainsaws out of five. “…he wants us to saw through our legs…..”. This actually starts to sound not so bad by the time you’ve seen about twenty minutes of the film. Saw gives Channel 5’s Plastic Surgery Live a run for its money on gruesome scenes of extreme physical violence that make your spine tingle. But is it only a big screen version of Plastic Surgery Live? No. You’ll be pleased to hear its far better. I’ve heard a lot of people comparing Saw to Seven. I’ve never liked comparing a new film to another as a way of categorizing or rating it. Firstly, the film used as the comparison is usually a good film that a lot of people know and like so you’re already setting the bar high for the new film. But the worst thing about such comparisons is that they are inevitably misleading. Yes, there are similarities between Saw and Seven but they are tenuous and on the whole incidental. Folks get killed in both movies, but don’t go to see Saw expecting Seven. It’s not as good. It’s a scary movie that expertly plays on some traditional and commonplace fears. Put your hand up if you’re scared of the dark, or evil clowns, or extreme physical torture. All these and more feature, employed within the wider plot to unsure that you’re never relaxed or able to eat your popcorn! This wider plot is somewhat sacrificed in order to cram as much horror in as possible. From a horror movie I don’t expect much else and to be fair it does keep you guessing until the very end. For all those of you out there that like to spoil films for yourselves by trying to guess the end or the next twist, I guarantee you wont get this one. The films plot flaws are not apparent while you are watching, its only afterwards while your thinking about it, alone, in the dark, checking the lock on your front door, that the things that don’t add up or were not fully explained become apparent. So you can’t count this against the film as it in no way affects how much you enjoy watching it. However, what does effect your enjoyment of the film are some of the acting turns. Cary Elwes, playing doctor Lawrence Gordon is a little ropey in parts of the film that you need him to be solid in order to keep you scared. What director James Wan so nearly achieves with Saw is the bridge between the straight forward shock slasher pic, like The Texas Chainsaw Massacreand the more involved slow burning psychological film, such as The Shining. It falls down because the performances don’t allow you to care enough about the pawns in the killer’s game. But how often do you identify with the characters in horror movies? I know that I spend a lot time hurling abuse at the fool that refuses to take a bat with him to the cellar. And I’m regularly pleased when the schmuck is finally put out of his misery. Darwinism in practice. 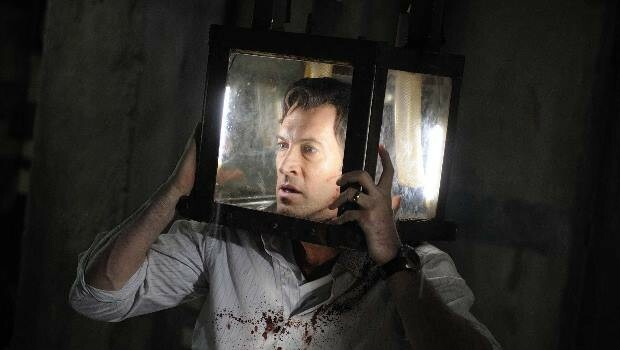 Saw is not a clever thriller, it’s a horror and what its missing in suspense it makes up for with splatter! People get it in some nasty and truly ingenious ways! Saw is a film that scared me in the cinema and made me make sure the wardrobe door was shut when I went to bed that night! Its no masterpiece but it gets at least three and half chainsaws out of five.